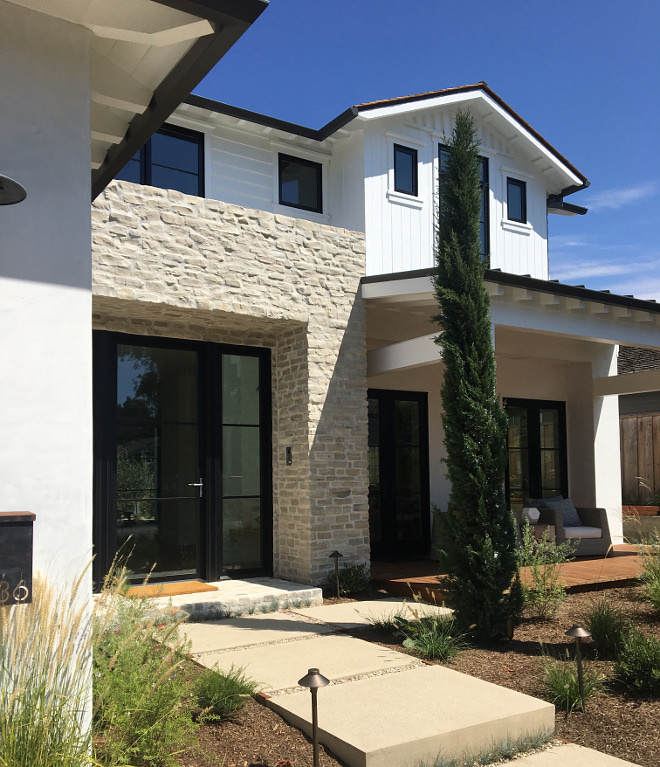 With architecture by Eric Aust Architect, this project is a ground up custom home done in the modern farmhouse style. 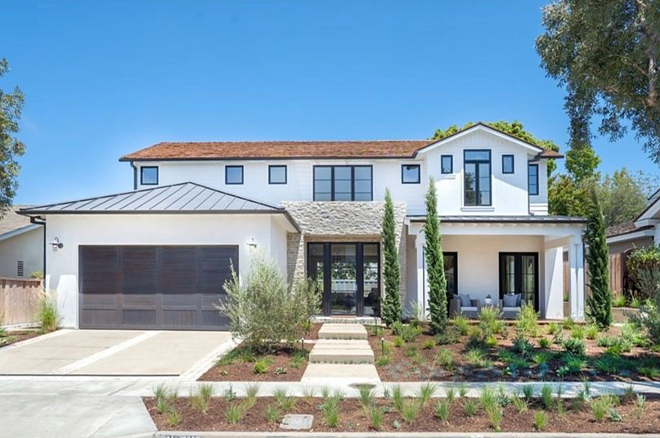 It’s located in the Port Street in Newport Beach, California. 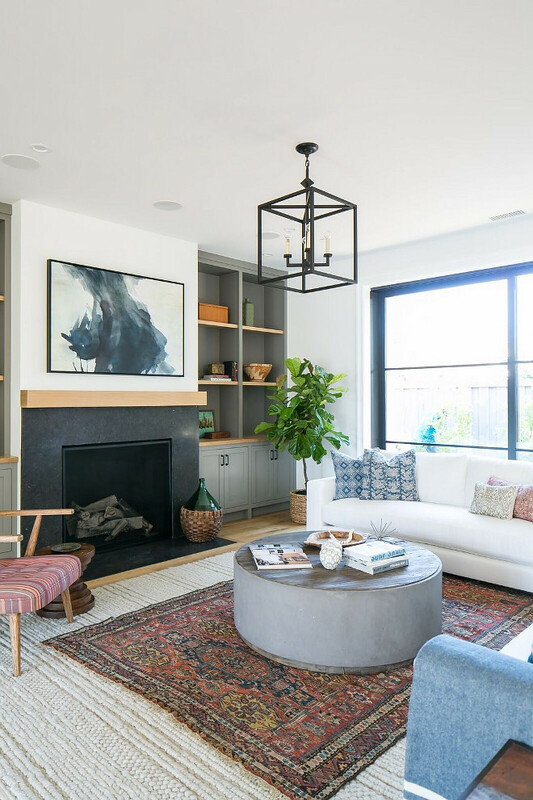 This home feels fresh and the flow of energy and natural light should inspire you. Oh, this is the Cali life! 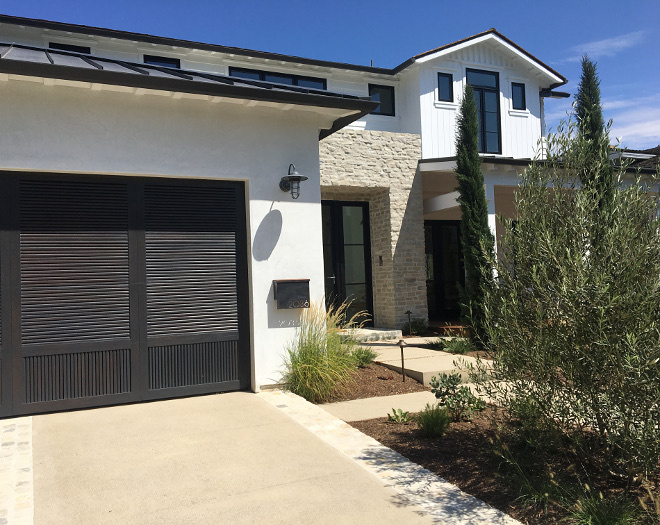 Garage Doors: Custom stained mahogany garage door Ziegler garage doors. Roof: Seam Metal roof on the first floor and cedar shingle roof on second story. 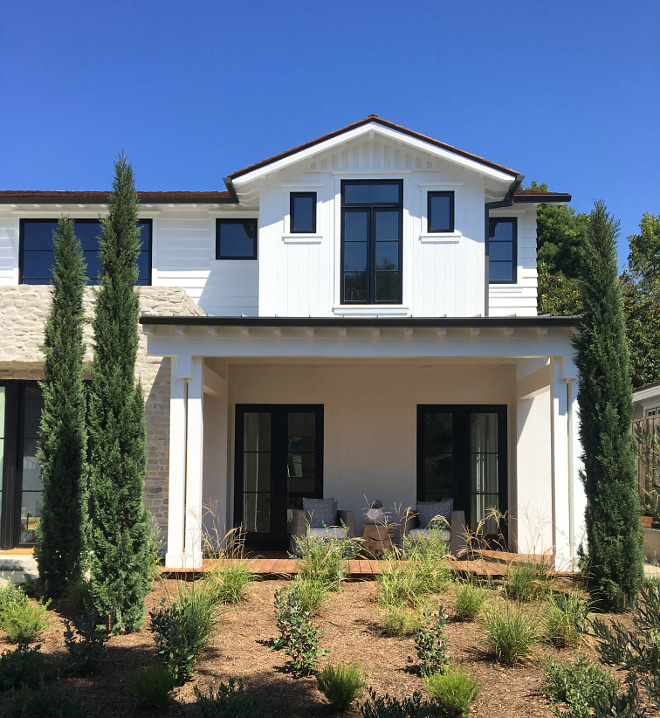 Exterior Paint Color: Dunn Edwards White. Landscape Design: Jana’s Garden – Laguna Beach. 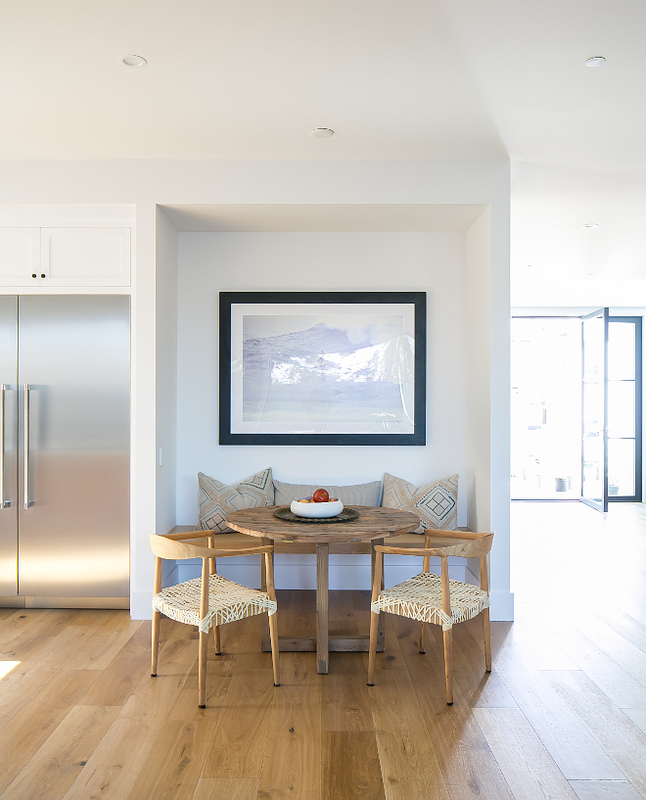 This stunning steel framed entry and sliding panel door system are La Cantina. The black windows are Jeld Wen. 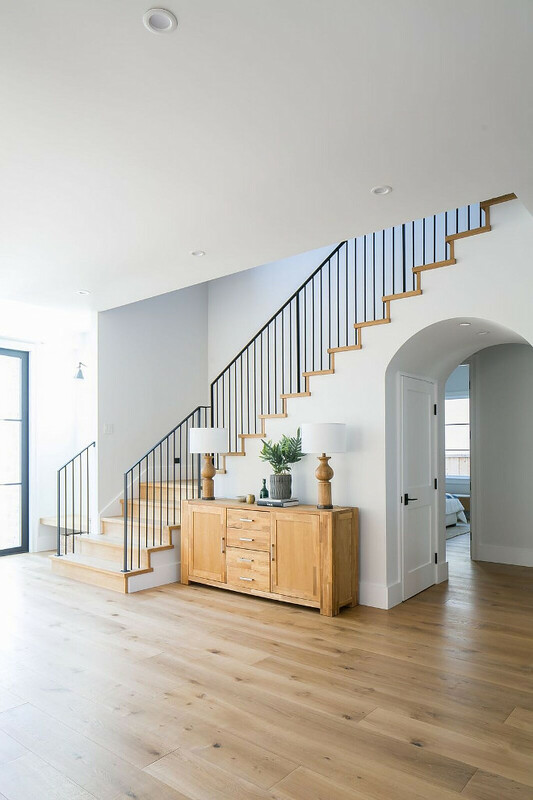 The foyer features a breathtaking custom staircase and arched halls. 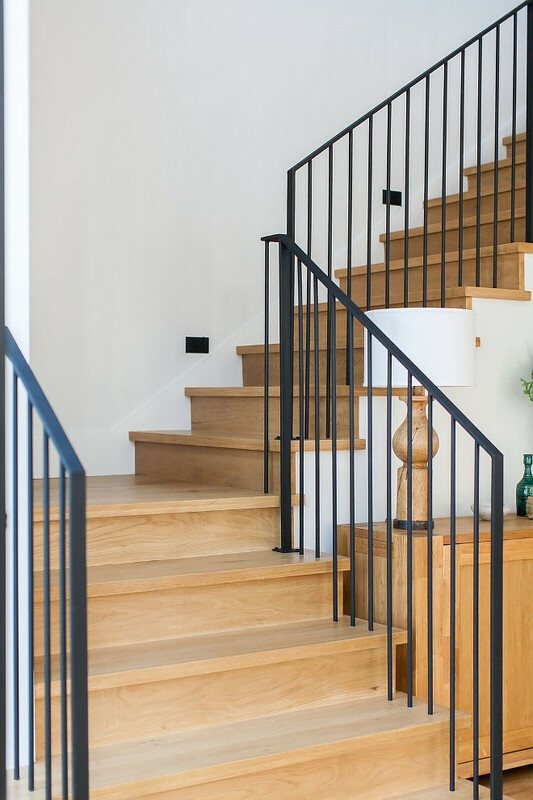 The staircase features white oak treads and wrought iron stair railing. 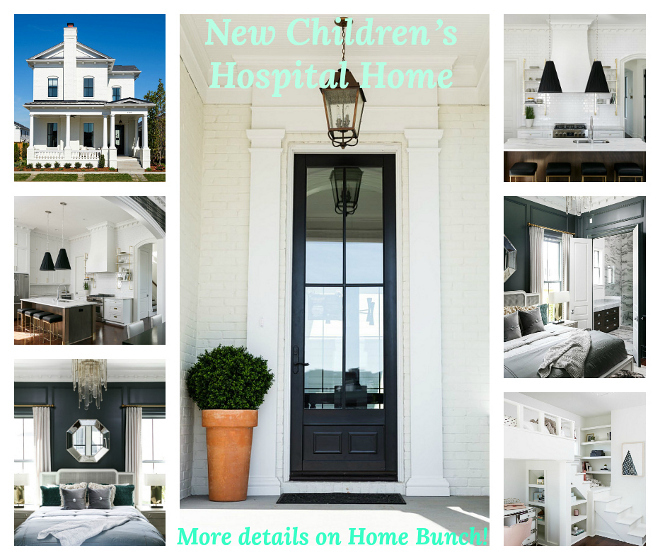 Walls and Ceiling Paint Color Throughout: Benjamin Moore White PM-2 in flat finish. 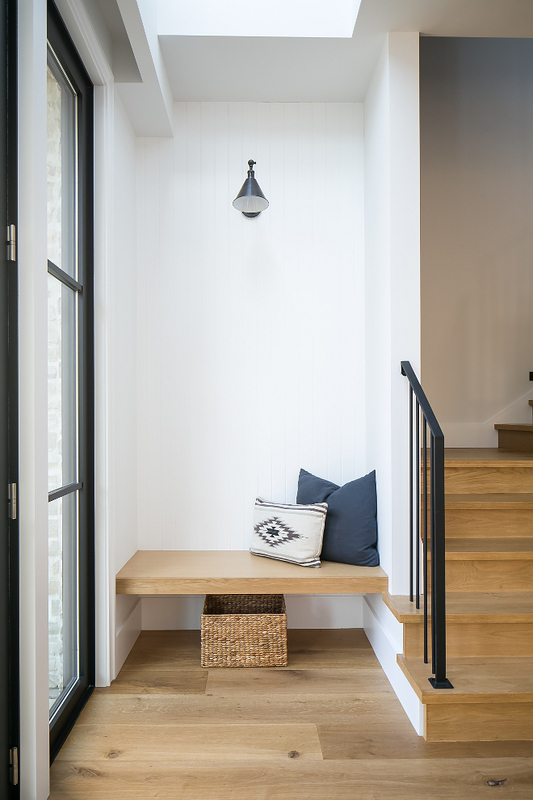 The front door opens to a foyer with White Oak floating benches on both sides. 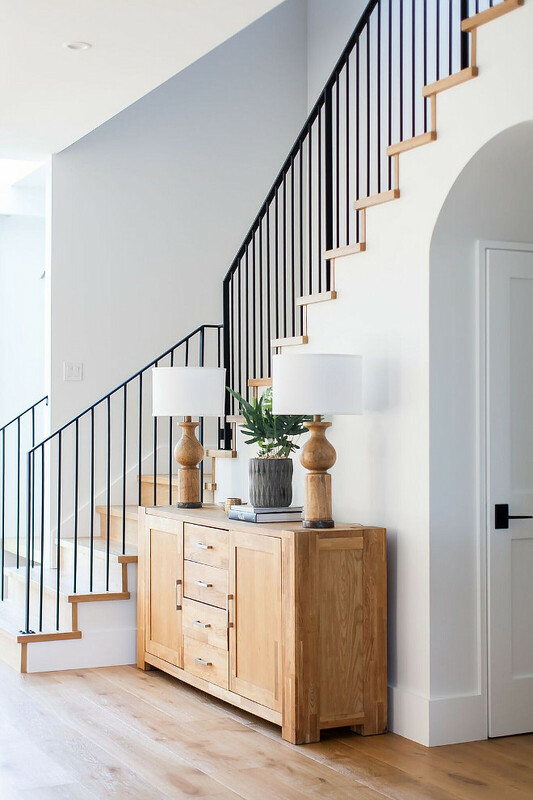 Entry sconces are Visual Comfort. Similar Lumbar Pillow: here, here, here, here, & here. Similar Basket: here, here or here. 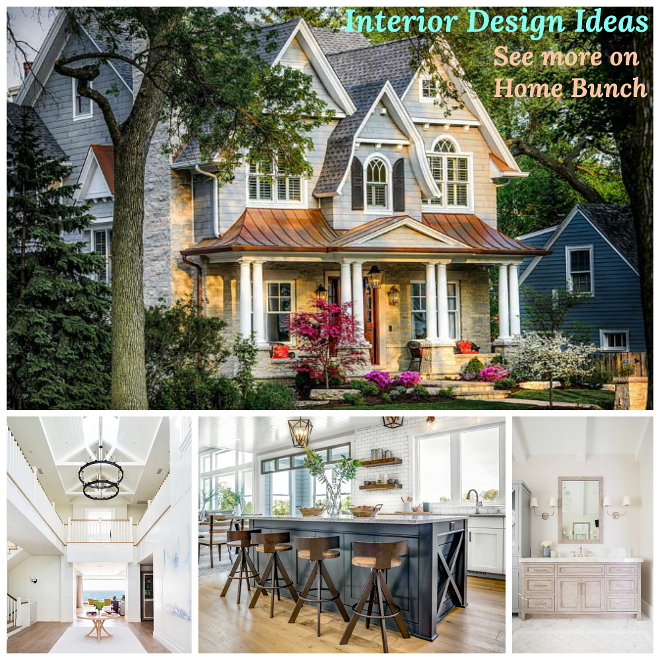 Furniture Staging through Meredith Baer – Home accessories by Clayton Builders. 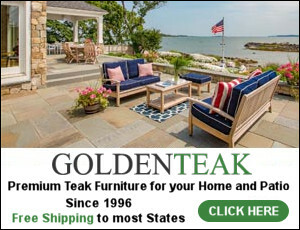 Flooring: 9″ white oak flooring/providence. Isn’t it gorgeous? Similar hardwood flooring: here & here. 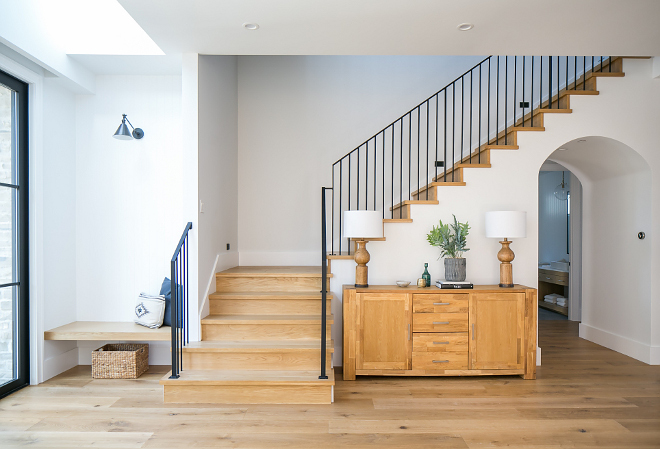 The foyer opens to a beautiful modern living room. 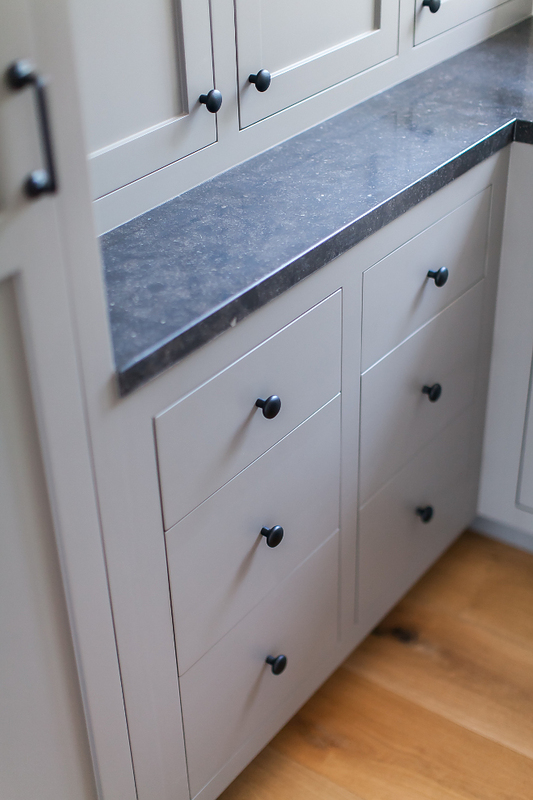 Grey Cabinet Paint Color: Farrow and Ball Mole’s Breath. Fireplace surround is honed Belgian Limestone. There’s nothing I don’t love here! Isn’t this look fun & fresh? 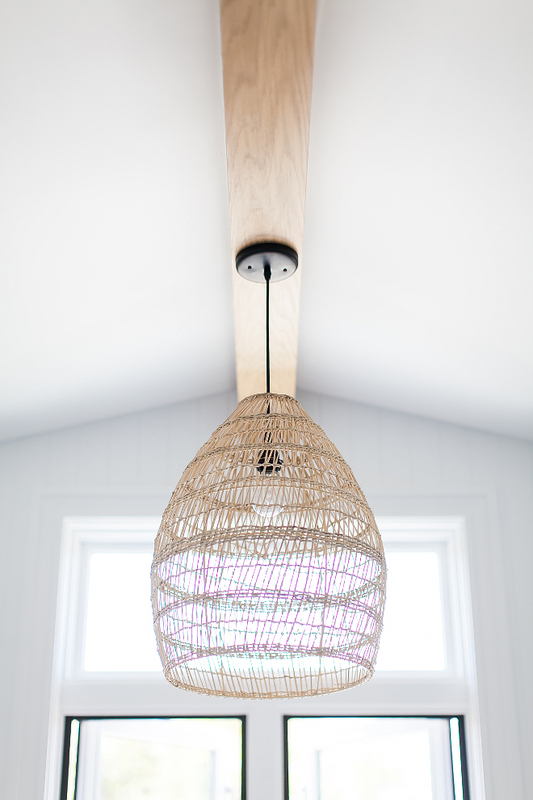 This new lantern pendant is by Visual Comfort. Similar Vintage Rug: here, here, here, here, here, here, here & here. Similar Hand-Woven Natural Area Rugs: here & here. I am loving this pillow combination. They’re light and fresh. 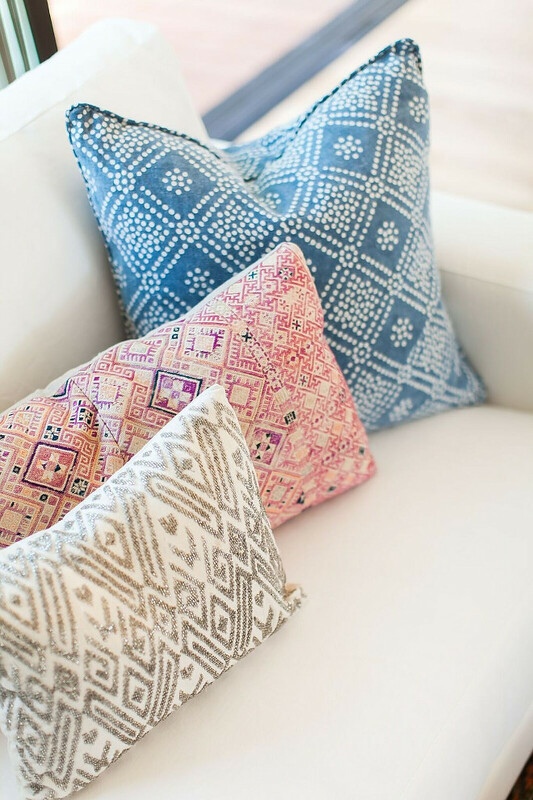 Similar pillows can be found here. 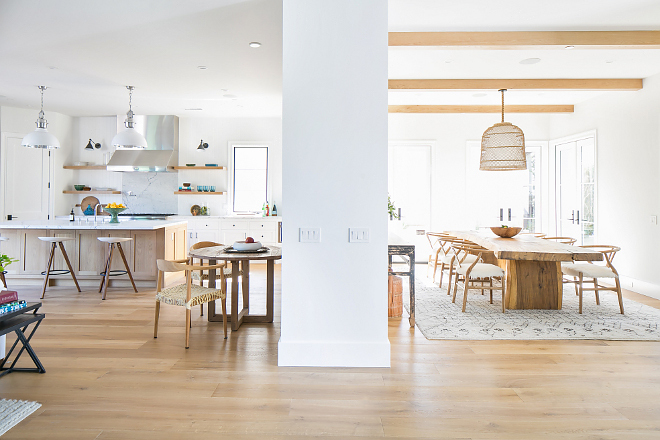 The living room opens to a bright modern farmhouse kitchen and breakfast room. 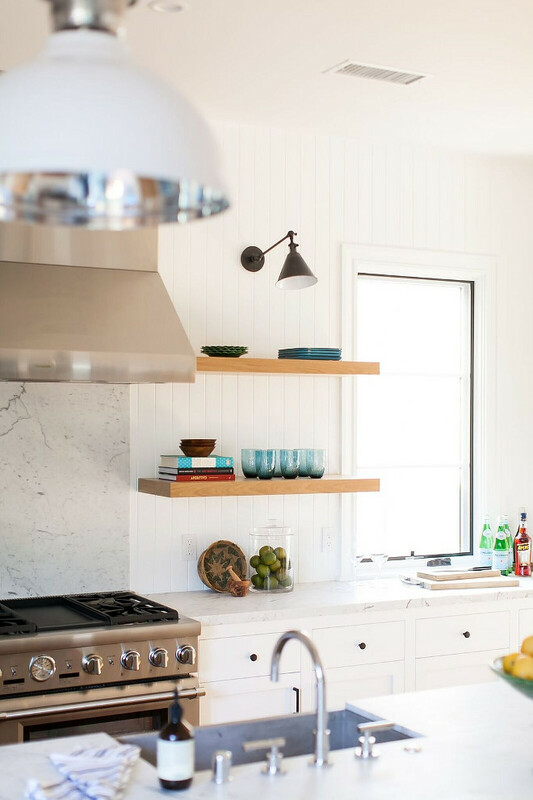 This modern farmhouse kitchen feels sleek without being cold. 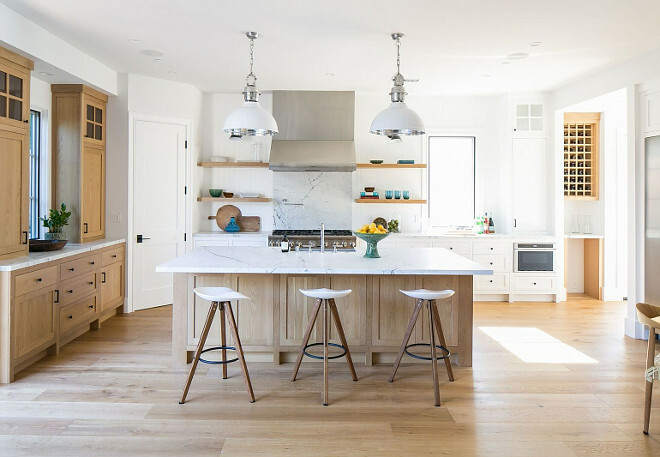 The kitchen layout is perfect for entertaining. Extra storage can be found in the walk-in pantry, located between the range wall and buffet cabinet . 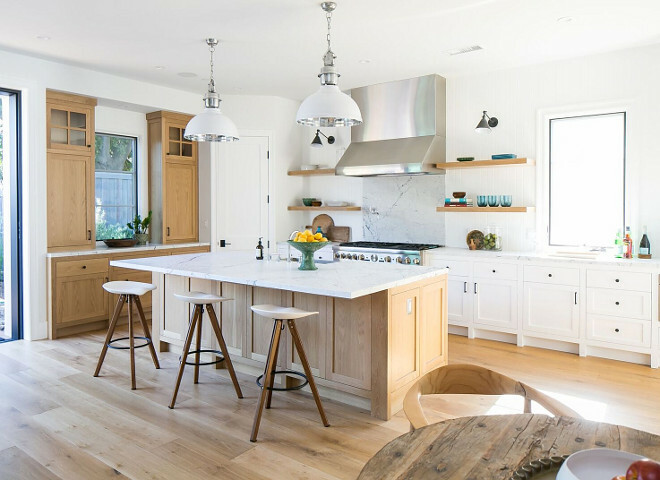 Kitchen pendants are Light & Living. Similar one – in black- can be found here. 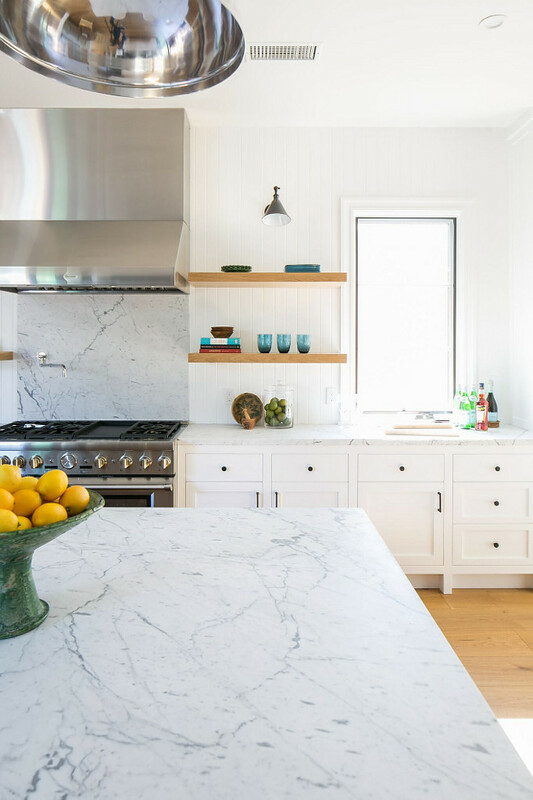 Countertop is Statuario Italian marble – honed. 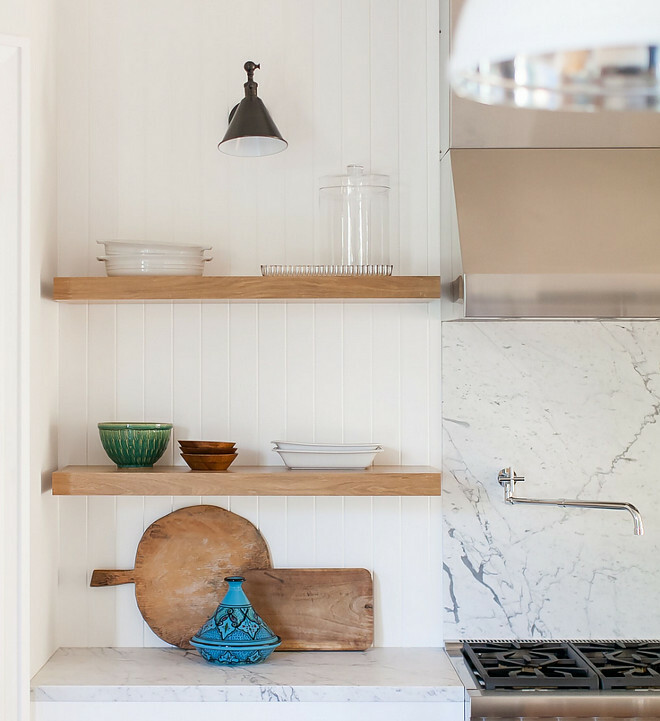 Kitchen shelf sconces are Visual Comfort. 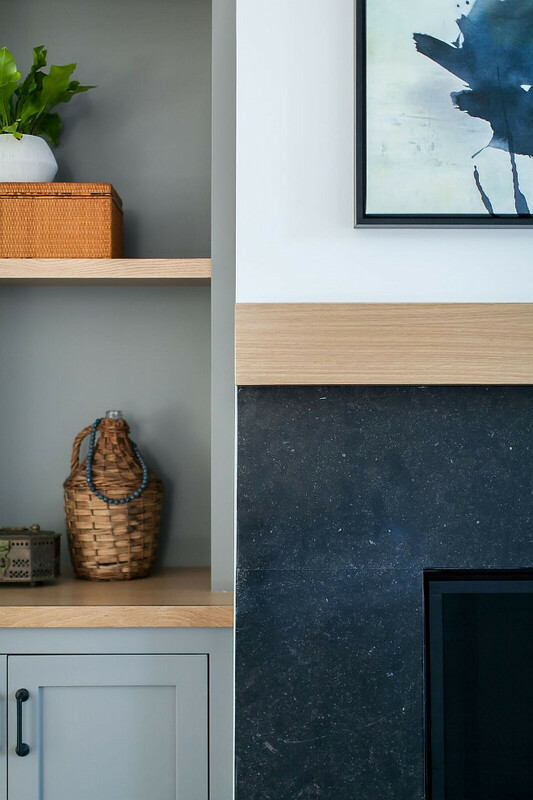 The custom chunky floating shelves are White Oak. 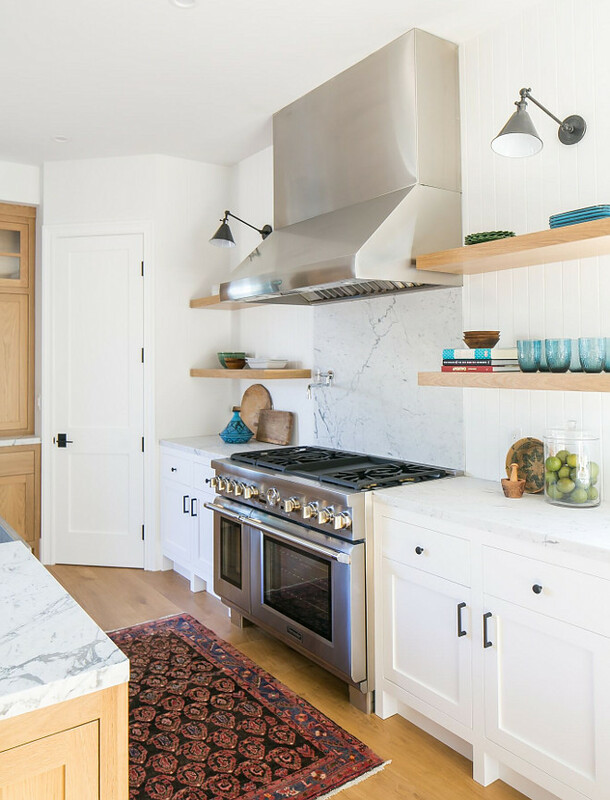 Backsplash is a combination of honed Statuario Italian marble and tongue & groove. The pot filler is Dornbracht Tara Wall-Mounted Pot Filler. 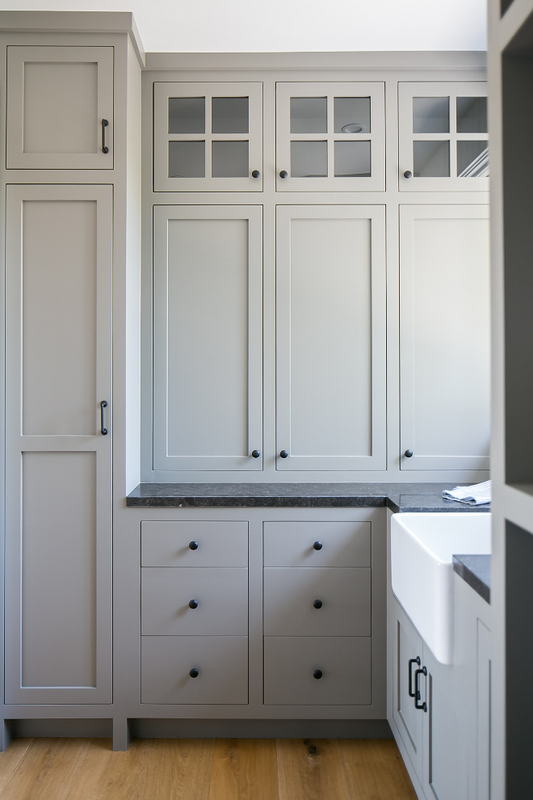 The cabinetry in kitchen is paint grade, shaker panel, painted in Dunn Edwards DEW380 eggshell finish. 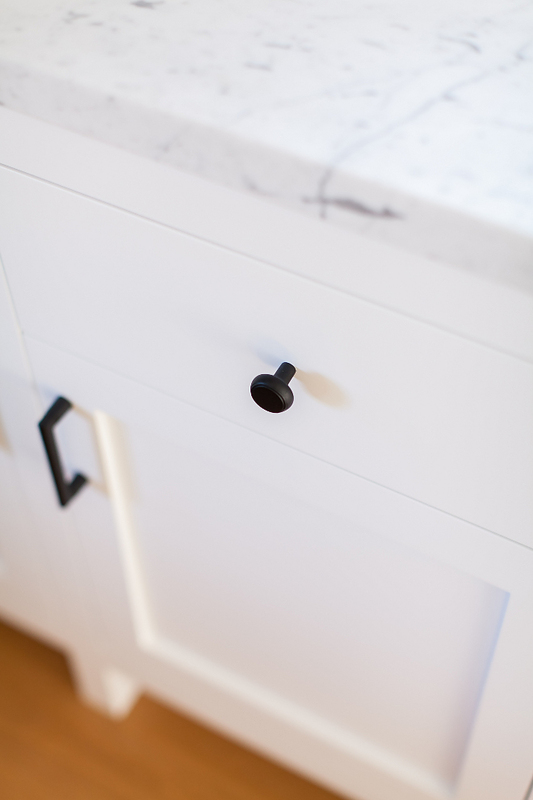 Cabinet hardware is Emtek – pulls & knobs. Similar concrete farmhouse sink can be found here. 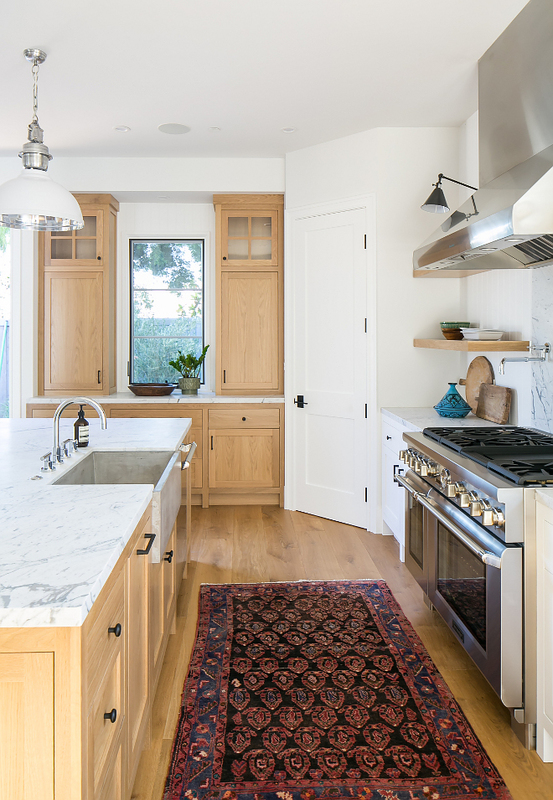 This beautiful kitchen also features a White Oak buffet cabinet with white marble countertop and black hardware. 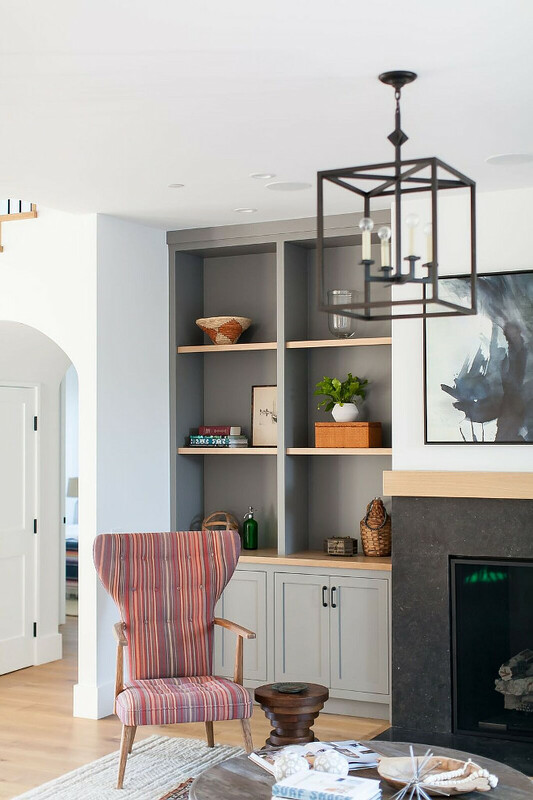 Located between the kitchen and family room, this breakfast nook feels cozy and inviting. 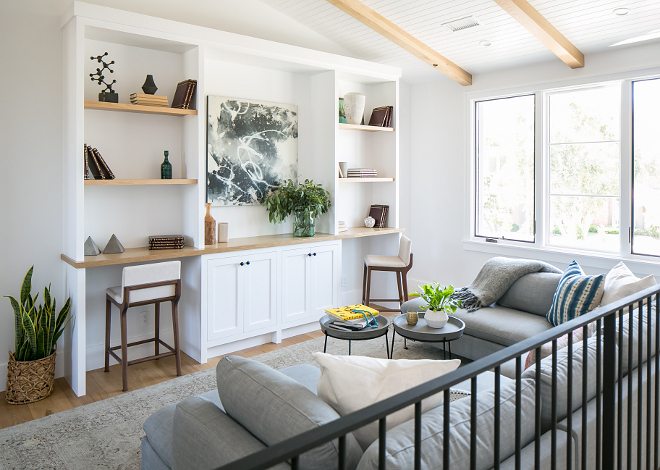 Notice the floating white oak bench. What a great layout! All main rooms feel connected but still distincted from each other. 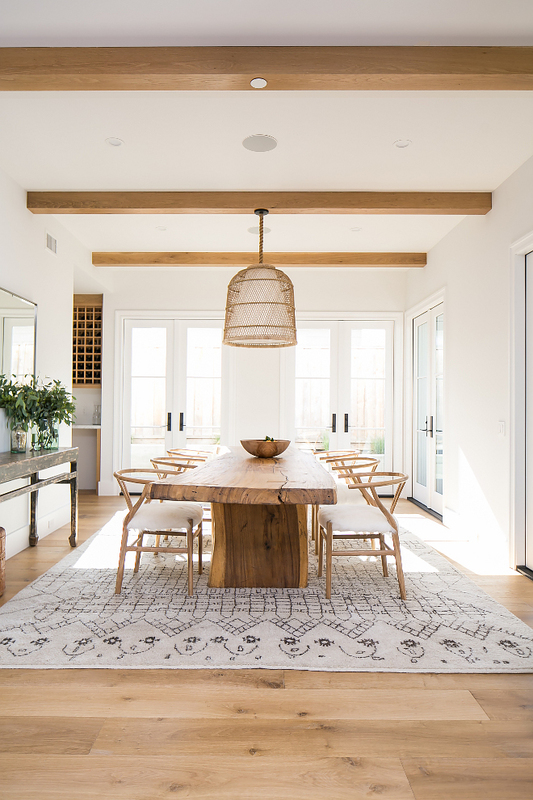 Isn’t this modern farmhouse dining room dreamy? 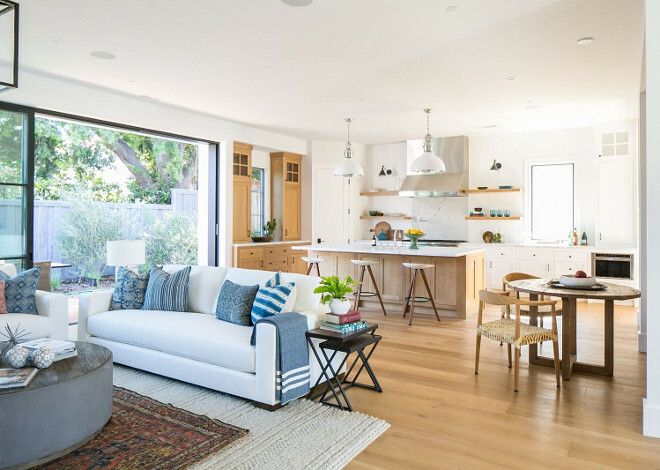 I love the natural light, the French doors and decor. 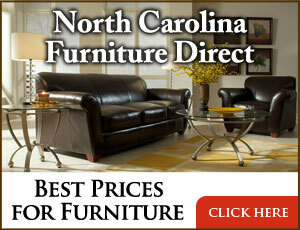 Faux Fur Wishbone Dining Chairs can be found here. 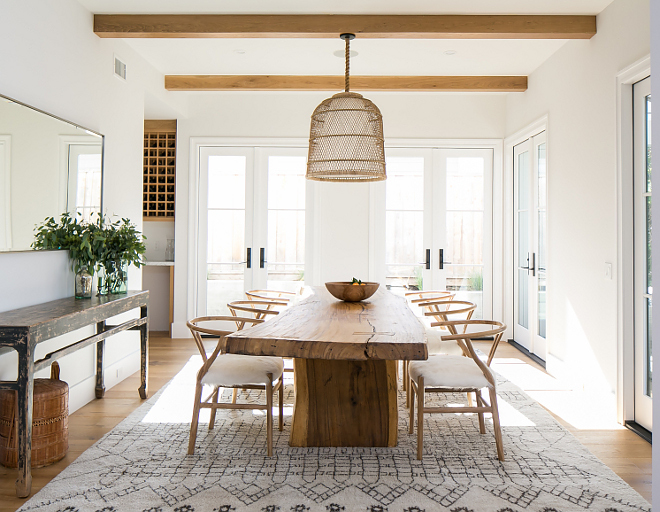 Similar Live Edge Dining Table can be found here. 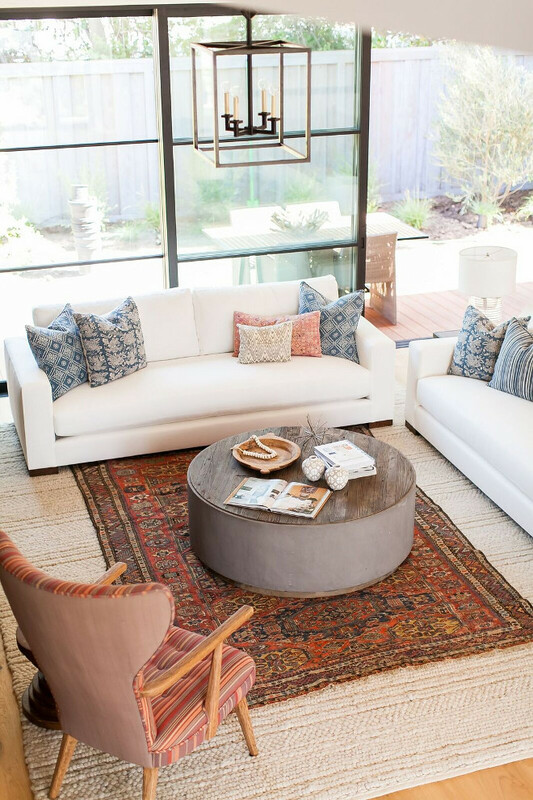 Similar rug: here & here. 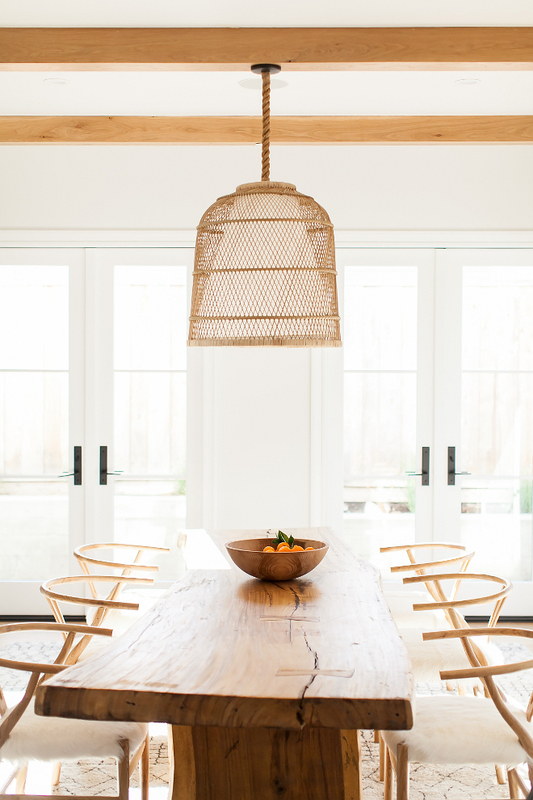 The rope and rattan basket cloche pendant is by Roost Lighting – similar one can be found here & here. Paint Color: Benjamin Moore White. 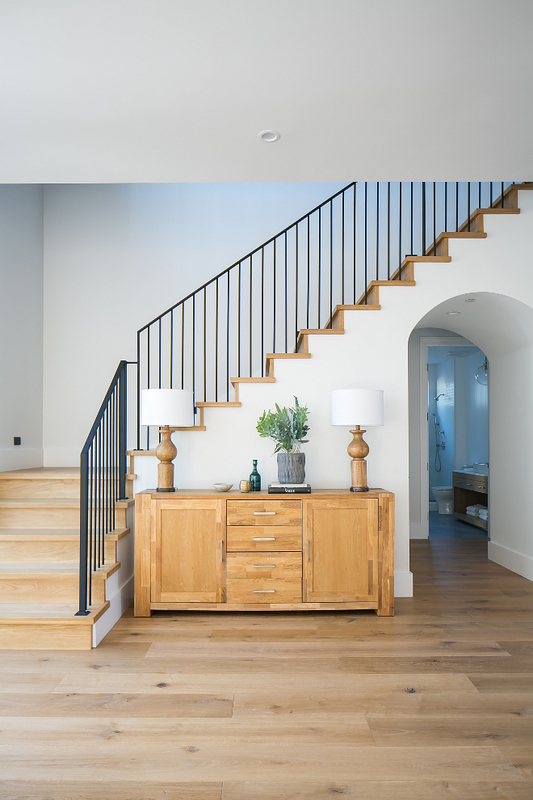 The upper landing features a custom desk/cabinet with tongue and groove & beams ceiling. 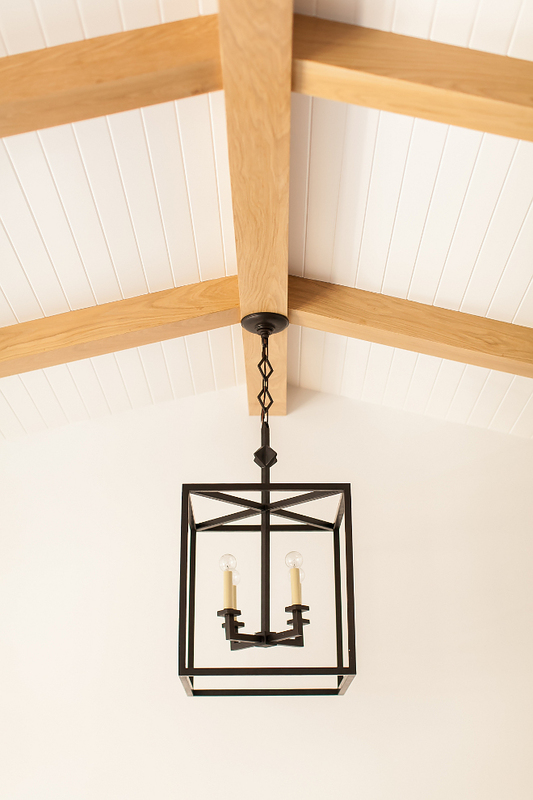 Lantern pendant is Star Lantern by Visual Comfort. 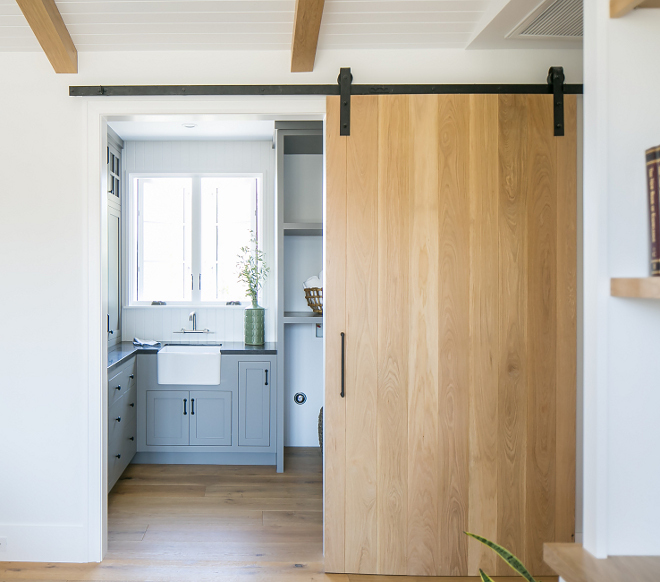 A White Oak barn door with natural clear lacquer finish conceals the laundry room. 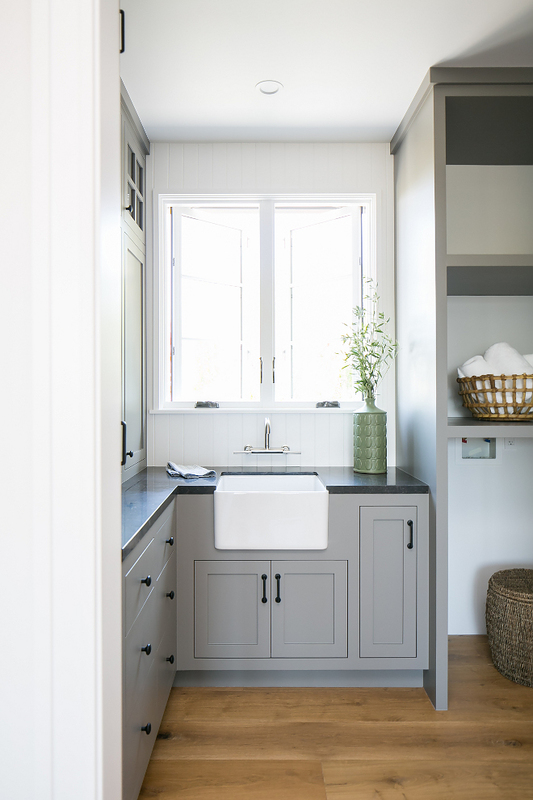 This grey laundry room features a small farmhouse sink and honed Belgian Limestone countertop. Farmhouse sink can be found here & here. Cabinet paint color is Farrow and Ball Mole’s Breath 276. 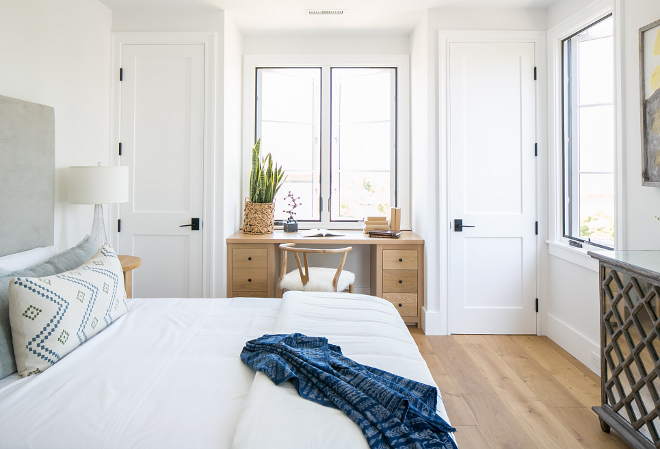 This guest bedroom features a custom White Oak desk – notice the symmetry. 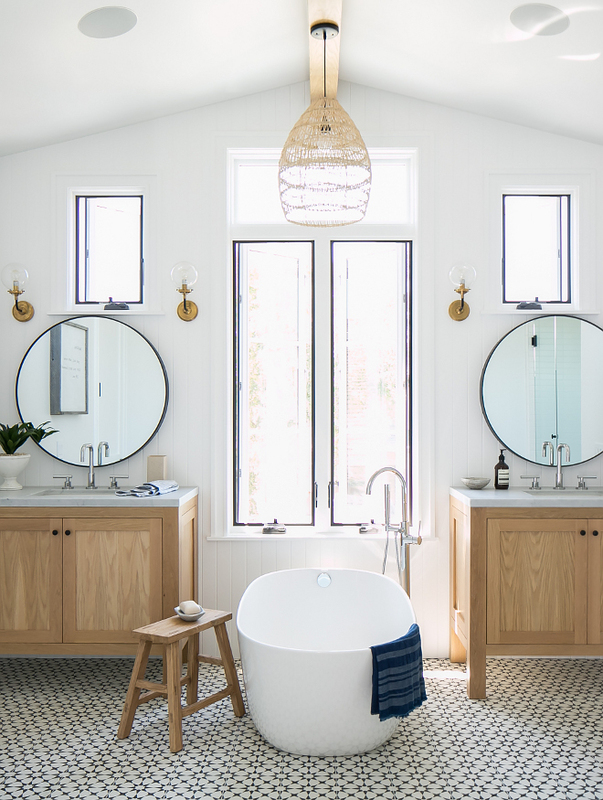 This modern farmhouse bathroom looks sleek and very current. 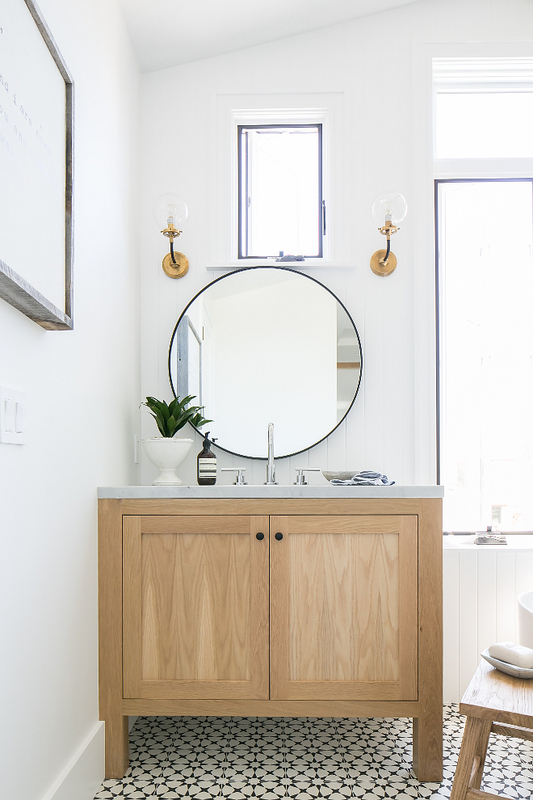 I love the custom white oak vanity, the hex floor tiles and the vertical tongue and groove walls. 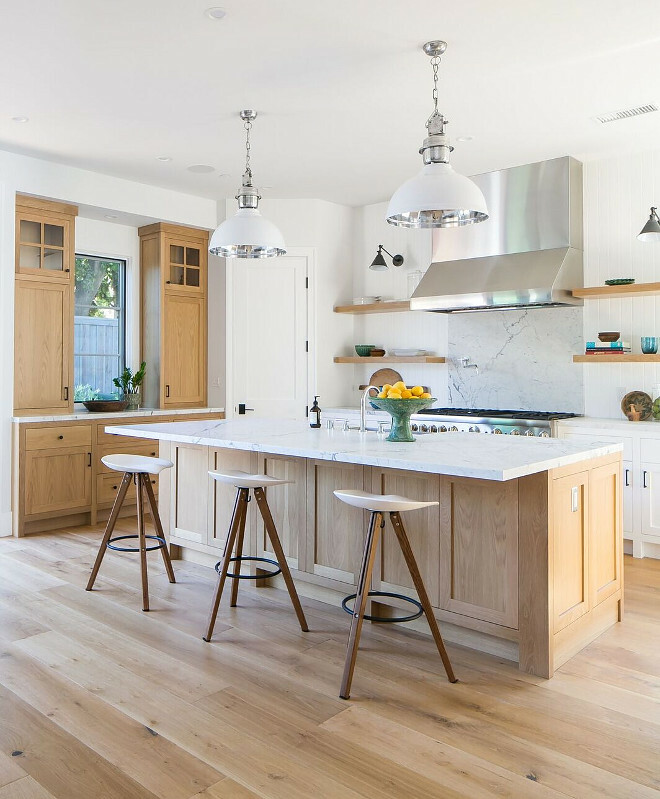 The white oak cabinetry has a natural clear lacquer finish. 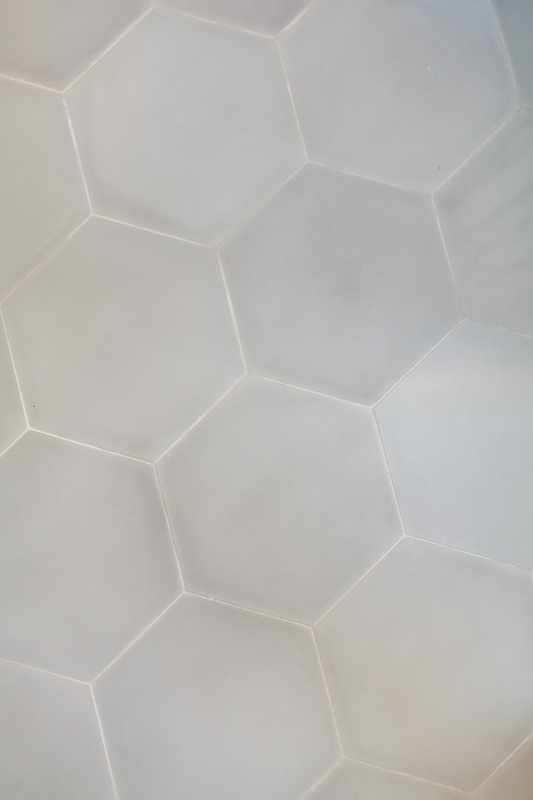 Flooring is a hex cement tile – Pacific Grey Hexagon. 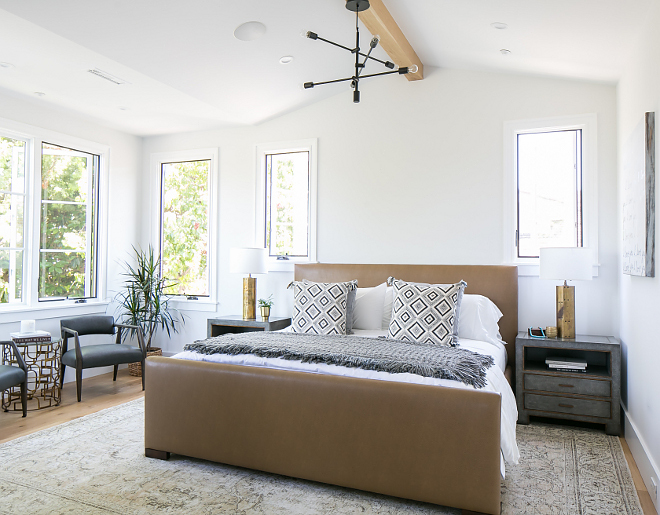 This master bedroom feels very bright. I am loving the ceiling beam and all of the windows. 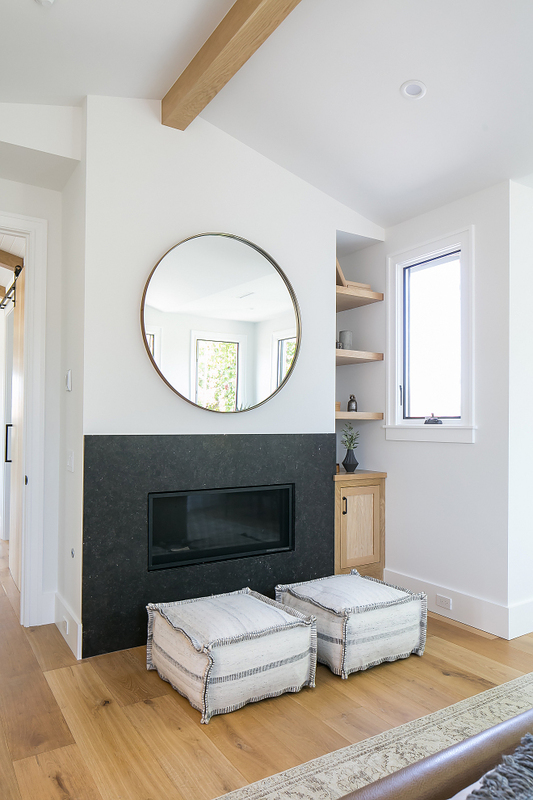 The bedroom fireplace is honed Belgian Limestone. The master bathroom is one of my favorite spaces of this house. Bedroom hardwood floor transition to master bathroom cement tile floor tile. 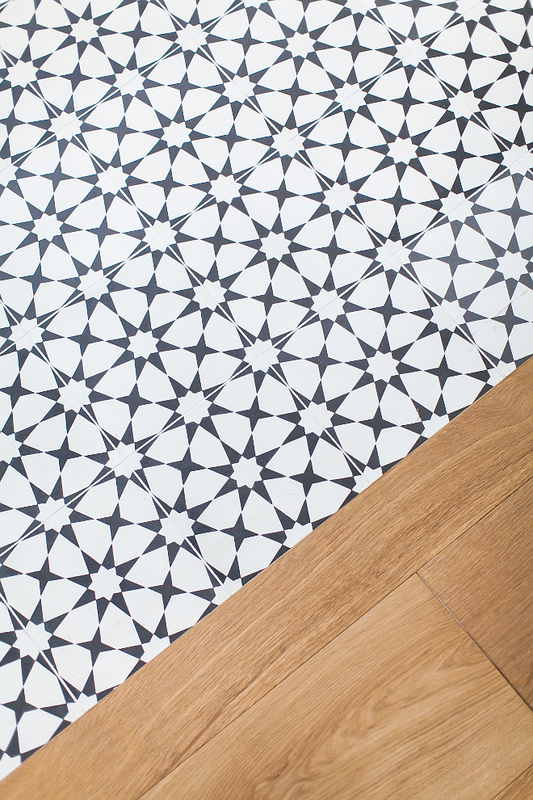 Cement tile can be found here. Master Bathroom ceiling lighting is world market. 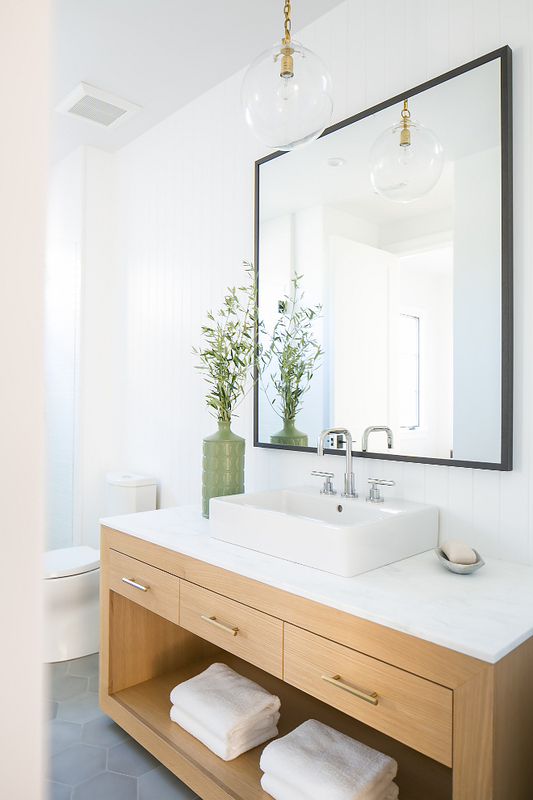 The white oak vanities feature honed Carrara marble countertop. 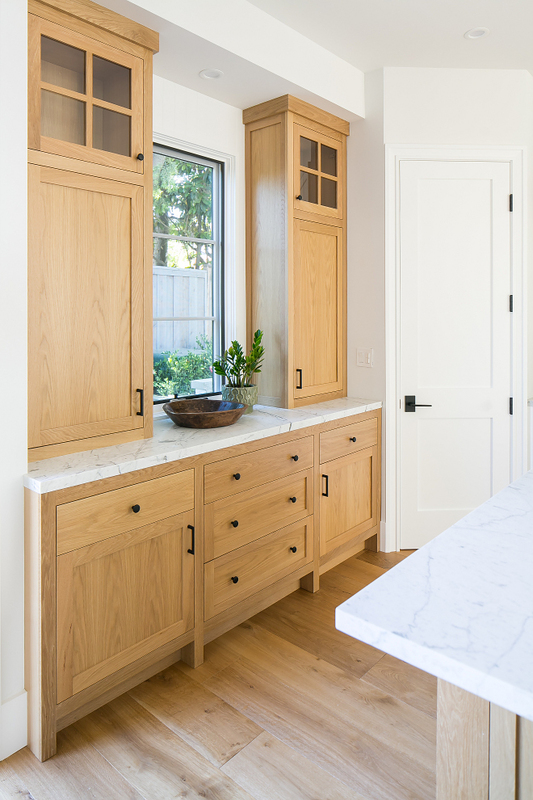 Cabinetry: Custom white oak cabinet by Millers Woodworking. 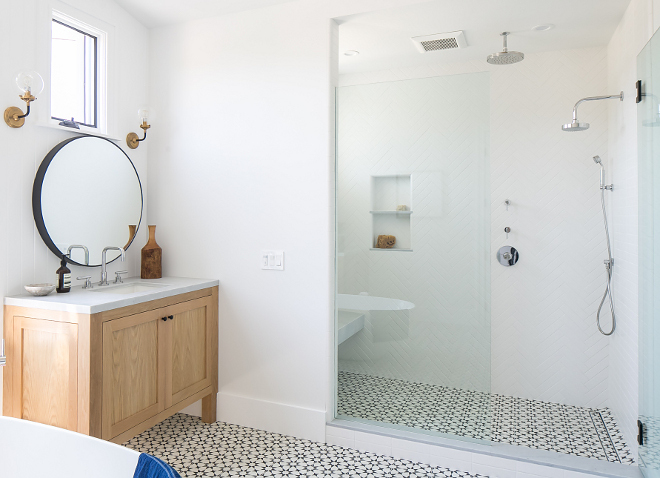 The shower wall tile is a white tile set in a herringbone pattern – Matte white 3×6 and 2.5 x 9 in straight joint, herringbone, and chevron patterns by Sonoma Tile. 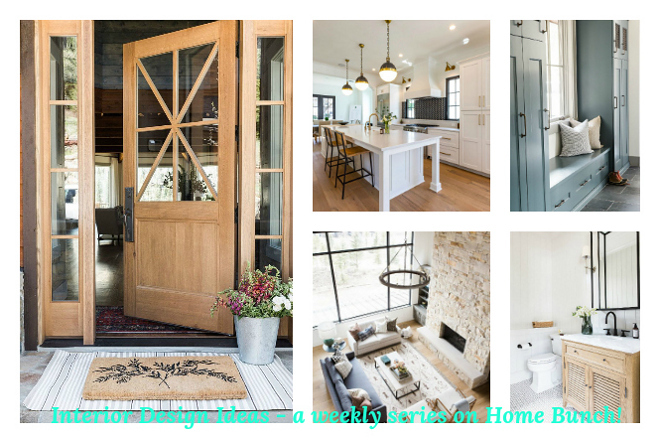 @BlueBarnAndCottage: Beautiful Homes of Instagram. 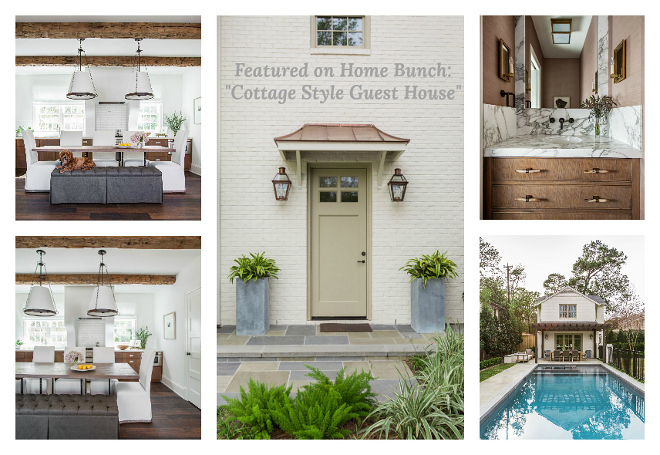 Tuesday: Cottage Style Guest House. 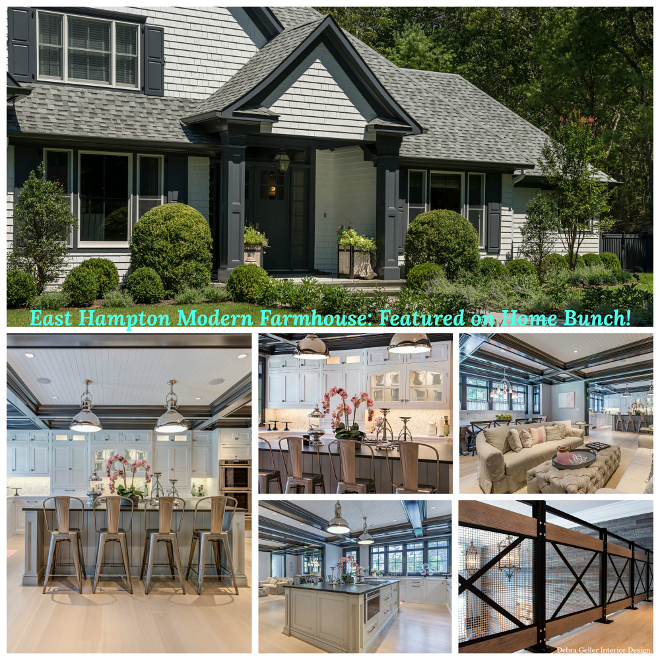 Wednesday: East Hampton Modern Farmhouse. 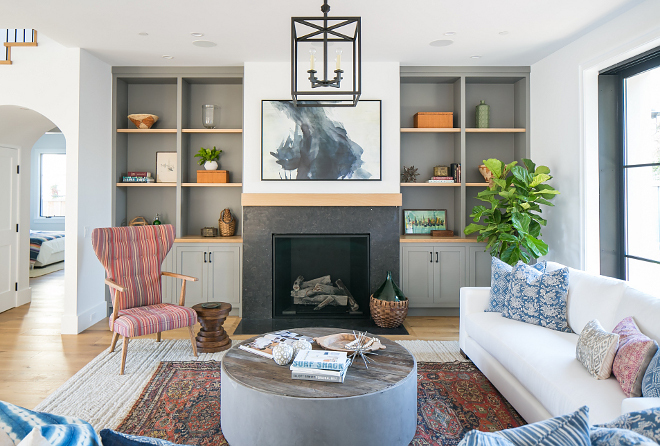 Hamptons-Inspired Home with Coastal Colors. 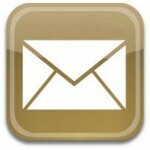 Pinterest: Many of you have written emails asking me why you aren’t being able to pin lately. Pinterest and I are working to resolve this issue and hopefully we’ll be able to pin very soon. Meanwhile, feel free to pin from my Instagram. Thank you for your support, my friends and have a Blessed week!